Welcome to the 2020 ISfTeH and JTTA joint meeting. 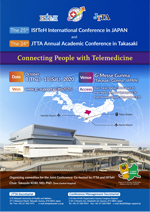 This conference will cover themes spanning updated knowledge about International and Japanese telemedicine and e-Health trends and solutions in the field of clinical medicine, international cooperation, policy, software, hardware, networking, security, wearables, robotics, artificial intelligence, and big data. Over 500 highly qualified doctors, health care professionals, government officials, medical technology professionals, scholars, and students will convene in one place over two days. The conference includes parallel English and Japanese tracks as well joint plenaries. Telemedicine provides medical treatment not confined by time and space, with the help of information and communication technologies. 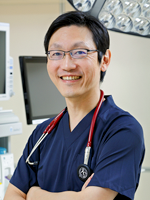 The base of medical care is the connection between people ; Kizuna, the bonds. Japan has a tradition to value the human relations called Kizuna. I’d like propose to realize telemedicine that reifies Kizuna with combination of human kindness and technologies from Japan. With the theme of Connecting People with Telemedicine, this joint meeting provides attendees with innovative insights and best practices on how to resolve problems in the fields of telemedicine and e-health. Copyright © 25th ISfTeH International Conference in JAPAN All Rights Reserved.